Dulwich Park is a 30.85-hectare (76.2-acre) park in Dulwich in the London Borough of Southwark, south London, England. The Park was created by the Metropolitan Board of Works from former farmland and meadows. While the initial design was by Charles Barry (junior), it was later refined by Lt Col J. J. Sexby (who also designed Battersea and parts of Southwark Parks). It was opened in 1890 by Lord Rosebery. 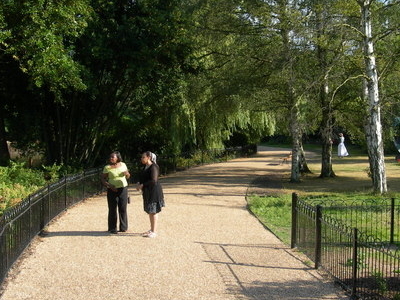 In 2004-6, the park was restored to its original Victorian layout, following a grant from the Heritage Lottery Fund. Dulwich Park contains a café, boating lake and numerous sporting facilities. Various types of recumbent bicycles are available for hire. Cars have not been permitted to drive inside the park since 2003, with the exception of disabled badge holders, but there is a free car park at the College Road entrance. It is home of Dulwich Park Runners, a minor running club. On 20 December 2011, a sculpture by Barbara Hepworth, Two Forms (Divided Circle) that resides in the park, was cut from its plinth and stolen by suspected scrap metal thieves. Here's the our members favorite photos of "Recreational Areas near London Borough of Southwark". Upload your photo of Dulwich Park!